Every week, New York Magazine writer-at-large Frank Rich talks with assistant editor Eric Benson about the biggest stories in politics and culture. 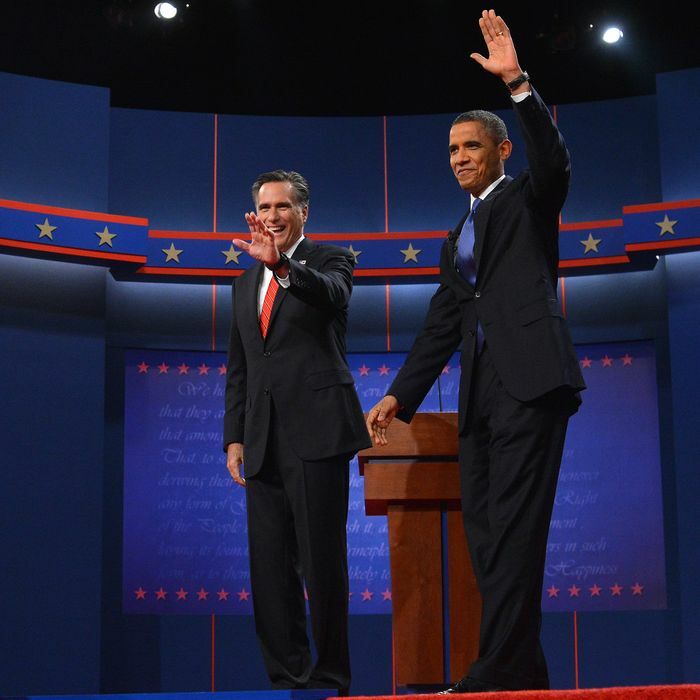 This week: why the debate was more boring than game-changing, and what Obama and Romney should do to prep for the next one. The overwhelming pundit consensus on last night’s debate was that it was a big win for Romney. Did you see it that way? It was an unequivocal win for Romney — or, more accurately, an utter stumble for Obama, who seemed to forget the most elemental strategies of his own campaign (and not just the 47 percent) and too often failed to counter the most obvious Romney disinformation. But was this a win big enough to merit so much GOP triumphalism (Michael Barone likened Mitt to Sitting Bull at Little Big Horn) and liberal bedwetting (“He may even have lost the election tonight” — Andrew Sullivan)? I don’t think so. The hyperbole on both sides reflects the Twitter-blogging-cable hothouse emotions of an overcaffeinated commentariat. That is a test sample containing perhaps zero undecided voters. Back in the real world, what I think the less committed public saw, especially in the crucial first half-hour, was a mostly tedious exchange of dueling numbers that only the guinea pigs in a Frank Luntz Fox News focus group could get worked up about. When there was a sudden, unexplained boom behind the two debaters in the early going, I wondered if it was a stagehand fainting from boredom. You said on Twitter during the debate that the whole thing could be “a non-event except for the junkies & partisans” unless it yielded sound bites that would be replayed over and over again. Did you hear any of those moments? Or do you think the debate will, indeed, end up as a non-event? You know you don’t have those sound-bite moments when the most memorable anyone can come up with involves Big Bird. The proof that they don’t exist could be found in both parties’ ads the next morning. The DNC had to make do with a spot showing Romney behaving like an entitled country-club swell riding roughshod over Jim Lehrer’s feeble efforts to cut off a filibuster. The RNC came up with “Smirk,” in which you see the president either looking down or bored as his opponent rattles off facts at a lightning pace. Neither ad is remotely effective, and the good news for Obama is that his failings were of focus, energy, verbal facility and, seemingly, memory rather than of the “you’re likable enough” kind. It was a mediocre performance, but too Ambien-esque to be memorable. Obama should be grateful for the GOP primary-season debates; those halcyon days of “Oops!” and “9-9-9!” raised the audience’s standard for gaffes to a level he didn’t remotely deliver. Obama is currently leading by big margins in the most vital swing states. Do you think we’ll see those erode after this? No idea. Most incumbent presidents lose their first debates — anyone remember the doddering Reagan of 1984? — with only temporary consequences. We’ll see. Of all the post-debate analytics, the most interesting, perhaps, was a non-Luntz focus group of undecided voters convened by NBC News in Denver. In the clip I saw, those who spoke up had kind words only for Romney. But when the moderator, Ron Allen, asked for hands to indicate who had now chosen a candidate to vote for on November 6, not one was raised. If you were Stuart Stevens, what would you do to capitalize on Romney’s performance? If you were David Axelrod, what would you do to come back from this? Perhaps using John Kerry as a surrogate was not the most brilliant idea. On Wednesday night’s Daily Show, Jon Stewart brought on Stephen Colbert to prepare him for this weekend’s webcast debate with Bill O’Reilly. Colbert might be a good coach for Obama, too. But seriously, this isn’t about Kerry or Axelrod or Plouffe, it’s about Obama. He has no one to blame but himself for his lack of concentration, specifics, and fight. And given that his convention speech was also pallid, it’s past time for him to wake up and fight. One thing Romney should do to prep for the next debate? Come up with a foreign policy that doesn’t sound like he’s running for president of Israel as a trigger-happy neocon. Luckily for Obama, that’s unlikely to happen with Dan Senor and the other Bush administration incompetents who populate Romney’s foreign-policy team. One thing Obama should do? Figure out what the hell he might be doing when he is listening to his opponent. Looking down at the podium or seemingly daydreaming about some place he’d rather be doesn’t cut it. Any advice for Candy Crowley and Bob Schieffer, the moderators of the next two debates, based on Jim Lehrer’s performance? What Lehrer did was inexcusable. He didn’t clearly explain the format, didn’t enforce it (whatever it was), didn’t effectively police anyone’s time (Obama spoke four minutes longer than Romney, not to Obama’s advantage) and provided a distracting off-camera soundtrack of grunts, failed interjections, and non sequiturs while making no attempts to adjudicate either of the candidates’ endless parades of facts and factoids. Crowley or Schieffer couldn’t duplicate this performance if they tried. But when the dust on 2012 has settled, it’s time we look into the old boys’ network that calls itself the debate commission and demand an accounting. To paraphrase Ronald Reagan, we are paying for these microphones.